We’ve endured relentless heat these past few weeks, and I’ve been searching for ways to cope. I’ve found that Gin and Tonic, with its crisp effervescence, makes a great summer cooler. When you’re suffering from summer doldrums, a G and T is the perfect remedy. Which seems fitting for a cocktail that originated as a medicinal drink. This drink is a snap to make. It’s just ice, gin, and tonic water. Add a squeeze of lime if you wish. That’s the whole recipe. OK, we’ll get fancy here and measure – because almost any cocktail is better if you measure the ingredients. But this is one case where you can mix a pretty decent drink just by eyeballing the gin as you pour it. Use a tall glass that holds 8 to 12 fluid ounces (see notes). Fill glass almost to top with ice cubes. If using the lime juice, squeeze into the glass. Measure gin and pour into glass. Garnish if you wish, and enjoy. Glass size is an important consideration for this drink. 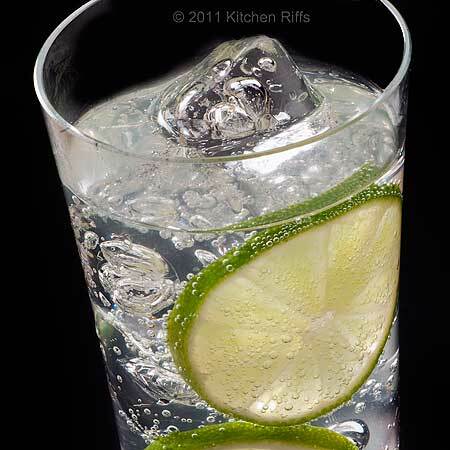 The G and T is a highball, so it works better in a glass that is tall rather than squat. Highball glasses generally hold 8 to 12 fluid ounces (10 ounces is my preferred size). If your glass is considerably more (or less) voluminous, you may want to adjust your ingredient measurements. Highballs typically contain a couple ounces of liquor and a much larger measure of mixer. The liquors most often used in highballs are gin, whiskey in all its forms, rum, vodka, and brandy. I usually eschew “diet” mixers because their artificial flavorings taste “off” to me. But I don’t seem to notice that problem too much with tonic water, so this is one drink where I sometimes use diet mixer to save a few calories. The brands of tonic water most of us see in supermarkets are Schweppes and Canada Dry. Both are decent quality. Lately, a large number of “boutique” tonics have appeared on the market (some people even make their own). A good place to shop for specialty tonic waters is KegWorks. If you’re having just one Gin and Tonic — I’m not sure that’s strictly legal, but to each his own — you’ll need only a few ounces of tonic water. You may want to buy 6-packs of tonic (each bottle contains 10 ounces or so) so you waste less. (Even tightly capped, whatever you leave in the bottle will quickly go flat in the refrigerator). 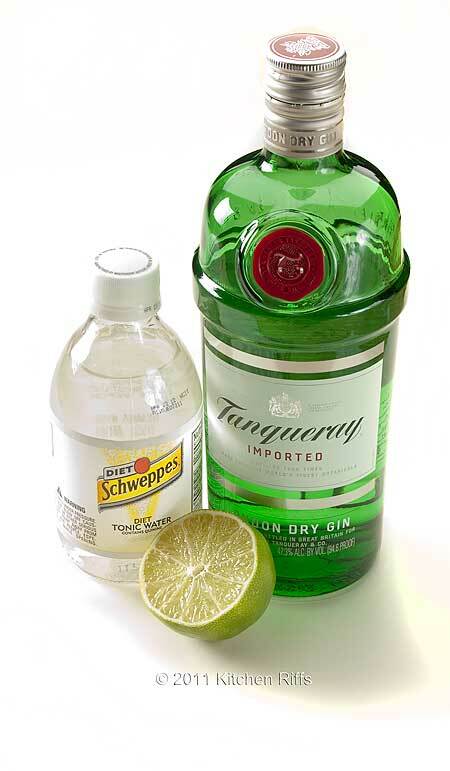 If you’re making G & T’s for a crowd, I’d buy the liter-size bottles of tonic. Tanqueray is my favorite gin for this drink. Its floral essences deliciously complement tonic. (Tanqueray also makes a pretty mean martini, though usually I prefer Plymouth for that libation.) 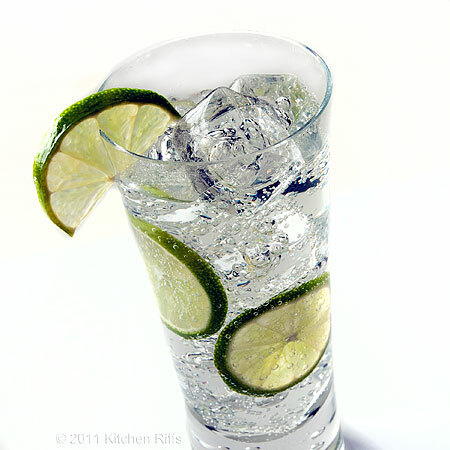 But every brand of gin I’ve tried works quite well in Gin and Tonic, so use whatever you have on hand. Adding fresh lime juice gives this drink a pleasant citrusy undertone. Try it with and without the lime and see which you prefer — it’s great either way. 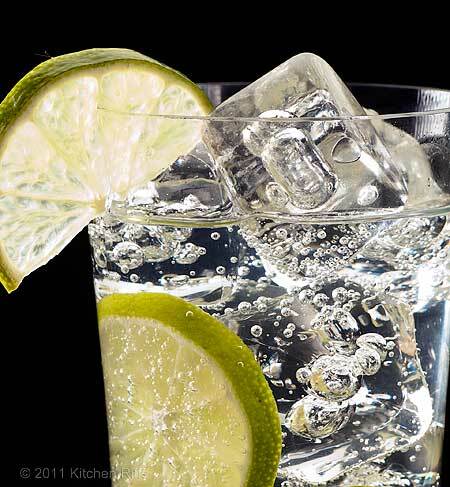 The G and T originated in India, where the British drank it for medicinal purposes (really). 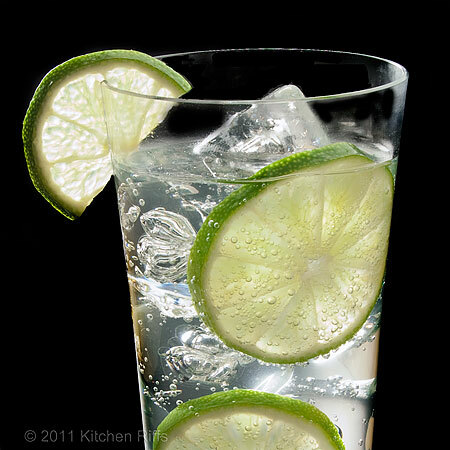 Tonic water contains quinine, a bitter-tasting substance that has long been used to prevent malaria. The original version of tonic water had a high quinine quotient, and the tonic wasn’t sweetened. Adding gin made the concoction a lot easier (and more interesting) to drink. Today’s tonic water contains much less quinine (though it still has some). And because it’s usually sweetened, tonic actually tastes good on its own, sans gin. In fact, it’s quite refreshing served neat if you’re hankering after something cool and nonalcoholic. But Wikipedia says that gin also started out as a medicinal beverage. In centuries past, it was a staple of pharmacies. Some people even drank it to ward off the plague. So I always take my tonic water with gin. A man can’t be too careful about these things. Love this, what a great summer cocktail! Hi Kelly, thanks for the compliment! The G&T really is a refreshing cocktail, excellent for this hot summer we're having. Thanks for commenting. Hi Susan, thanks! Glad you enjoyed it, and thanks for commenting. Hi Danielle, thanks for the comment. I've not tried Hendricks gin, but I've heard glowing comments about it. I'll definitely give it a try. You also make an excellent point regarding the juniper - I know an awful lot of people who've had an early, "bad" experience with gin, and have sworn it off. In most cases I think it is the scent of the flavorings - particularly the juniper - in the gin that makes them unwilling to try it again (aromas carry memories, as Proust demonstrated). Hendricks might be just the ticket for those folks. Thanks again. Hi Katie, it's a great drink! Might be a bit more refreshing when it's hot out, but good anytime. Thanks for commenting.